Chase McElyea looks on at some of the art chosen for a gallery exhibit at Arts in the Heart Gallery. The art was created during the July session of Arty Camp at CNY Arts Center. 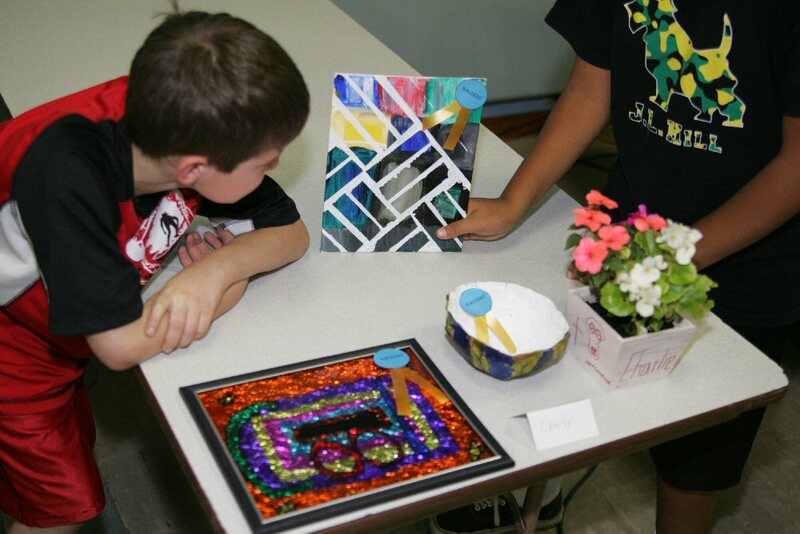 FULTON, NY – With five full days of art instruction and afternoon art projects, campers at this year’s Arty Day Camp created a portfolio of art samples, some of which are now on exhibit at Arts in the Heart Gallery in downtown Fulton. Chase McElyea looks at some of the art chosen for a gallery exhibit at Arts in the Heart Gallery. 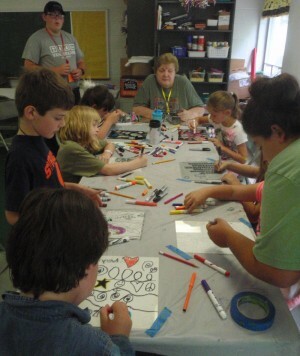 The art was created during the July session of Arty Camp at CNY Arts Center. Arty Day Camp is run by CNY Arts Center for a week each in July and August for ages 5-15 at 357 State St.
Art classes taught by Kendra Matott guided children to explore the works of selected master artists and create art using the artist’s technique. From printmaking the monoprints of Harry Bertoia to outdoor sculptures like Andy Goldsworthy and scanograms as used by local artist Lisa Davis, campers worked hard to duplicate the techniques. Monique Harrison’s group created art from recycled materials including fabric art, recycled bottle art, silhouettes on newsprint, fingerprint art and ink blotting among others. Afternoons are free and open to all children in the community who made art projects from a variety of ideas including painting glass mugs, decorative planters, stained glass foil pictures and more, led by Mary Jane Visser. Selected works from each child were chosen for display at Arts in the Heart Gallery at 47 S. First St. in downtown Fulton. The artwork will stay on display until the close of the next session of camp, August 11-15 when a new collection of art will take its place. Registrations are ongoing for the August session of Arty Camp which offers students art, dance and theatre classes along with lunch and afternoon group art projects from 9 a.m. to 2 p.m. for ages 5 to 15. CNY Arts Center is designated as a Summer Meal Site to offer free lunches to community children 18 and under during the week of ARTY Day Camp. Children who attend the lunch are included in afternoon art projects at no charge. Mary Jane Visser, afternoon art coordinator, directs a group of campers in art projects as part of the free afternoon art program during Arty Camp at CNY Arts Center located in State Street Methodist Church at the corner of State and Park streets. Additional scholarship funds are available thanks to the generosity of Fulton Noon Rotary Club, and Carroll’s Corporation. Parents, family and friends are encouraged to stop in the gallery, run by CNY Arts Center volunteers, at 47 S. First St. and enjoy the entire collection of local artists.